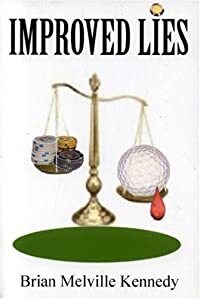 Improved Lies by Brian Kennedy, a Mysterious Review. Review: Brian Kennedy has created a compelling courtroom suspense thriller with his first novel, Improved Lies, set among the country club elite of northern Michigan. Defense attorney Ken Edwards has an almost impossible task. His client, businessman Ted Armbruster, is accused of murdering his wife in their home. The evidence: Ted was found standing over the body, the murder weapon, a bloody golf club, in his hands. To top it off he admitted being responsible for her death, signing a confession witnessed by his neighbor, a friend and also an lawyer. But Ted later swears to Ken that he's innocent and Ken believes him. While preparing for trial, Ken comes across a number of suspects that might have wanted to see Ted's wife dead, some with both motive and opportunity, but none seem strong enough to break the prosecution's case. Ted would rather go to jail than accept a plea bargain, so Ken has no choice but to try to persuade the jury that reasonable doubt exists and that his client should be found not guilty of murder. The author uses golf as a metaphor for the law, and a round of golf as a metaphor for a trial. The title is a play on words: an improved lie in golf is the intentional alteration of a ball's position so to make it easier to hit. As Ken Edwards states in his closing arguments, "to improve your lie is to cheat." He then goes on to say, "It is to ignore the truth about where your ball has come to rest and to create a false reality by cheating to gain advantage." For the crime being tried, he explains, "[I]t's best not to lose sight of the tangled web that lying creates. First, the lie; then the cover-up, or improved lie; then, when that fails, murder." Improved Lies, like many legal thrillers, is split into two parts: the pre-trial investigation followed by the trial itself. Both work well here. The investigation brings multiple red herrings into the story, information that may (or may not) point to the guilt (or innocence) of third parties (or Ted), all of which are intended to introduce reasonable doubt into the minds of the jurors. Ken is hampered in part by restrictions placed on him by his client, restrictions he doesn't quite understand nor is he prepared to honor if it means his client may be found guilty. But the best part of the book is the trial which, for the most part, is riveting. The author's experience as an attorney comes through here with an authenticity that keeps the reader deeply absorbed in what happens, almost as if they were part of the jury. Other than a few plot points that don't quite work (most glaringly, Ken neglecting to ask an obvious question about an investment club that factors into his defense), Improved Lies is an exceptional legal thriller that will keep the reader guessing as to the outcome until the final pages. Acknowledgment: Durban House provided an ARC of Improved Lies for this review.